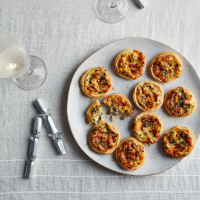 Stilton, everyone's favourite festive cheese, takes centre stage in these moreish tartlets. Serve them at your Christmas drinks party – we’re certain they’ll be a hit. 1. Preheat the oven to 190ºC, gas mark 5. On a lightly floured surface, roll out the pastry thinly then, using an 8cm cutter, stamp out rounds and use to line a 12-hole fairy cake or bun tin. 2. In a bowl, beat together the mascarpone, eggs and chives, then stir in the ham and Stilton. Divide among the pastry cases and bake for 20-25 minutes until set and golden brown. Make up to 24 hours ahead of serving and keep chilled. Reheat for 15 minutes until warmed all the way through.